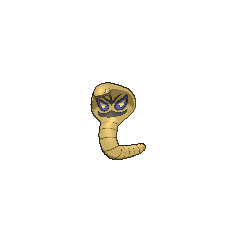 Arbok in game: 560 Who? Important notice! 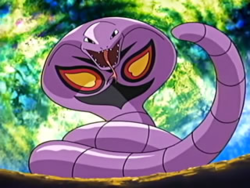 Pokemon Arbok is a fictional character of humans. Arbok is a serpent like Pokémon with purple scales all over its body. It has a large hood just below its head. On its hood, it has a design much like an angry face, which can come in six variations. The pattern typically has red and yellow eyespot outlined it black, a wide black streak resembling a mouth, and a V-shaped stripe about the face pattern. Arbok is capable of crushing opponents by coiling its body around them and squeeze them tightly. It can even flatten steel oil drums. If it encounters an enemy, it raises its head, mimics the opponent with the frightening pattern on its body and making eerie sounds by expelling air from its mouth. It has been stated that if any part of Arbok's body except for the head is cut off, it can regrow the rest of its body again in a matter of a few weeks. It also has the ability to detect vibrations as shown in the anime. 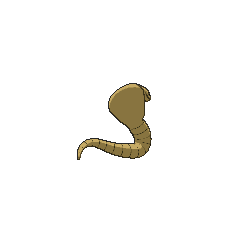 Arbok has been known to be capable of spending long periods underwater and surviving in aquatic environments. 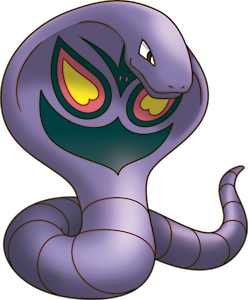 One particular Arbok could change its pattern at any time to increase power to different stats and get invulnerability to status conditions, if the pattern is uncovered. Arbok is territorial. It lashes out at intruders with long fangs tipped with deadly venom. With a vengeful nature, it will not give up a chase once it targets its prey or an opponent, no matter how far. It makes its home in grassy savannas and plains. In the wild, it hunts smaller Pokémon, using the pattern on its hood to immobilize prey and using its toxic bite to finish them off and eat them. It is also capable of paralyzing opponents with its former signature move, Glare. Jessie had an Arbok that she obtained as an Ekans. It first appeared in Pokémon Emergency!. It was extremely loyal to her and was her primary battling Pokémon until A Poached Ego!, when she set it free along with James's Weezing to protect a wild group of Ekans and Koffing. Multiple Arbok also appeared in The Power of One. In Ring Masters, Arbok was one of the Pokémon used in the Sumo Conference. An Arbok was used by one of the students of the Pokémon Trainer's School in Gonna Rule The School!. A Coordinator's Arbok appeared in What I Did for Love! participating in the Performance Stage of the Gardenia Contest. An Arbok is used by one of the students of Pokémon Summer Academy in the first leg of the Pokémon Triathlon in One Team, Two Team, Red Team, Blue Team!. An Arbok made an appearance in the opening of Destiny Deoxys. An Arbok appeared in a fantasy in A Keeper for Keeps?!. 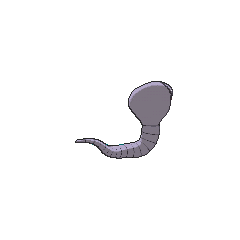 An Arbok appeared in SM003, as a silhouette. Agatha used an Arbok against Blue's Rhydon in The Challenger and lost. An Arbok was shown under the ownership of a Team Rocket Grunt that invaded the Goldenrod Radio Tower in The Legacy. 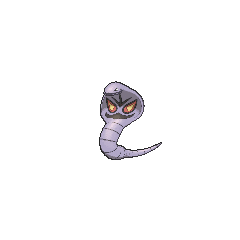 Arbok first appeared in That Awful Arbok! under the ownership of Koga. Koga and Agatha both have Arbok as important parts of their teams in Pokémon Adventures where Agatha's first appeared in Muk Raking. 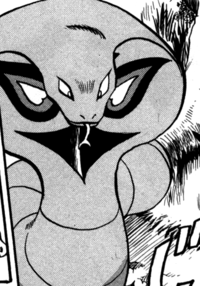 In Pokémon Adventures, the pattern on an Arbok's belly may give an Arbok special abilities. With the help of Agatha's smoke, Agatha's Arbok had the ability to switch between a several different patterns: a standard pattern, a speed-boosting pattern, an attack-boosting pattern, and an invulnerability pattern that repels poisons. Koga's Arbok instead has only one pattern, which is a regenerative pattern that allows it to regenerate any part of its body as long as the head remains intact. Crystal captured an Arbok on her way to Professor Elm's Lab in Three Cheers for Chikorita. In The Last Battle XIII an Arbok was one of the Pokémon sent to help the fight in Ilex Forest. Team Rocket General Ariana's Arbok appeared in Dealing With A Koffing Fit. It was able to overcome Bonee's Bone Club with ease. In Weavile Wobbles But It Won't Fall Down, a Arbok appeared at the Safari Zone, which Silver attempted to capture. In the most infamous Pokémon Trainer's Choice in A Fan with a Plan, Arbok was erroneously claimed to evolve into Seviper. The face-like pattern on Arbok's chest has differences between games. Its appearance in Generations I, IV, V, VI and FireRed and LeafGreen differs from the variants shown in Generation II and in Ruby, Sapphire, and Emerald. 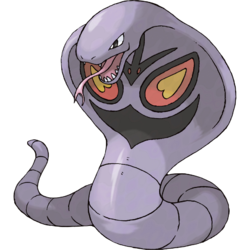 This supports Pokédex text which notes differences between Arbok in different areas; however, its markings in Johto- and Hoenn-based remakes differ from those in the original games set in those regions. Arbok is the tallest Poison-type Pokémon.